Mr. Harald Schützeichel studied (church) music and catholic theology and wrote his musicology dissertation about “The organ in the life and mind of Albert Schweitzer”. He also studied business and marketing and worked for six years as director of the Catholic Academy in Freiburg. He was co-founder and first director of the German Solar Electricity Company, which he headed for six years. He teaches business ethics at the University of Freiburg and still works occasionally as a business coach. He made a conscious choice to leave the solar company, after successfully placing it on the stock exchange, when he realized that a hectic manager life just for making lots of money was not a meaningful life for him. He started to combine his vision of ethics, morals and justice with his passion for solar energy and established the Solar Energy Foundation in 2005. Harald Schützeichel initiated the foundation in 2004. He first made an in-depth analysis, what went and still goes wrong with development aid in so-called development countries – especially in Africa. His clear goal and part of his success story was to avoid all the mistakes made so far. 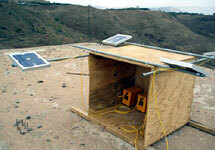 The main objective of the foundation is not simply to bring clean and renewable electricity to the rural poor in Africa. It is a means to alleviate poverty and establish a model, showing how local business could be developed. Rightly they call their programme not “Light for Ethiopia” but “Light for Education”. Bringing light to the villages is very important for education, health and economic development and also brings an important sign of hope to the rural population that there are improvements in living conditions, reducing pressure to emigrate to the (slums of) big cities. The solar lamps also have a significant environmental improvement potential. They replace the kerosene lamps, which need about 70 litres of petroleum per year and produce 170 kilogram of CO². After a pilot project to install solar units in 30 huts, a plan has been made to provide the village Rema with over 1.200 households with solar electricity. This year 3.000 units will be installed, which then will grow next year to 7.000 units. Already in the second year of its existence 15.000 people are benefiting from the foundation’s work. So far 35 people are employed in the country. The foundation initiates joint ventures of the industry, so that the manufacturing of solar equipment will now be transferred to Ethiopia. 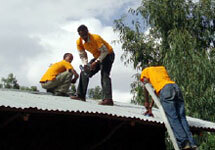 The foundation has also set up a school, where they train electricians to become solar experts. They are then helped to set up their own businesses to spread solar technology to the villages. The foundation started a tree planting programme around their basis and school in Rema and has a new plan to establish an organic garden. The staff of the foundation has built a place for poor and lonely elderly people in Rema, which they call the social club. Key to the successful work in Ethiopia is Mr. Samson Tsegaye, who shares the mission and dream of bringing solar energy to Ethiopia. What makes this project outstanding is its approach not to work as a classical “charity” donor. The Solar Foundation gives real meaning to the famous Chinese proverb about feeding a person either by giving him a fish or teaching him to fish. In this context it could read “If you want to give people light for a week, give them a torch and batteries, but if you want them to have light and electricity forever, help them to get their own solar unit”. Although the project is new, it has already shown that it has great growth possibilities not only in Ethiopia but for the whole of Africa and developing countries in the south.